A wandering patient is one of a caregiver’s greatest worries. But with patient safety alarms, you can rest assured knowing that you will be alerted if your patient or loved one gets up from a bed or wheelchair, or if a door is opened. These specially designed alarms monitor patient movement, and alert the caregiver or facility staff when this happens. These safety alarms are an important part of a fall prevention program, as it can be dangerous for many patients to leave their beds or wheelchairs without supervision or aid. Patients with Alzheimer’s disease or dementia often have tendencies to wander and get lost in their confusion, but patient safety alarms can help alert you when this happens, helping to prevent this fearful risk. 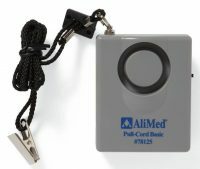 If pin connector is pulled from this classic pull-cord alarm, the alarm will sound. 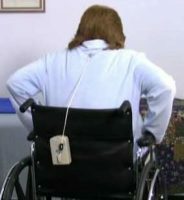 Activation cord adjusts from 18″ to 36″ and clips to patient’s clothing. 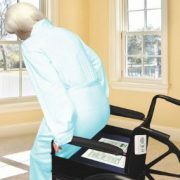 Secures to chair or bed with self- contained clip or with the included hook-and-loop fastener.